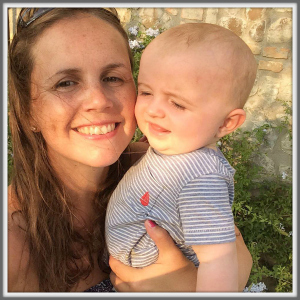 We have been having such a quiet week indoors due to the little one’s virus. 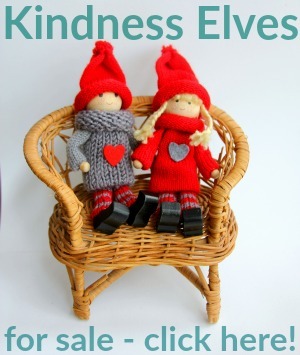 Poor old Cakie has been restless and I’ve had to try and think of new things for her to do. 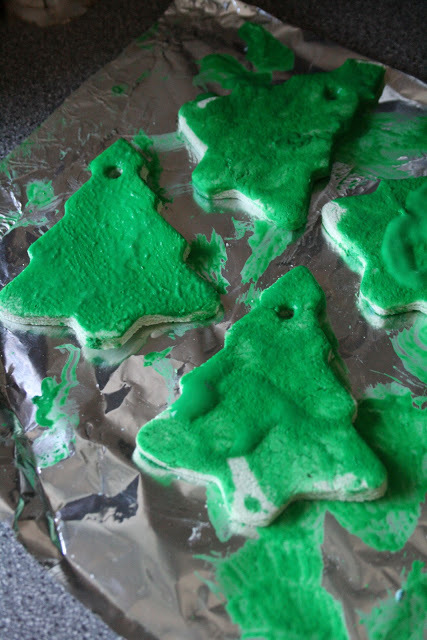 Thankfully we already had the cinnamon play-dough so we pulled that out again and made some pretend Christmas cookies (and they smelt very convincing!) 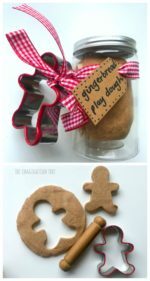 Play dough made this way can be kept for a couple of months in an air tight container- brilliant for lazy busy weeks! We also made some salt dough and used it to cut out some simple shapes for making into Christmas tree decorations. I slightly altered the recipe from the last time we made salt dough because I didn’t have enough salt. 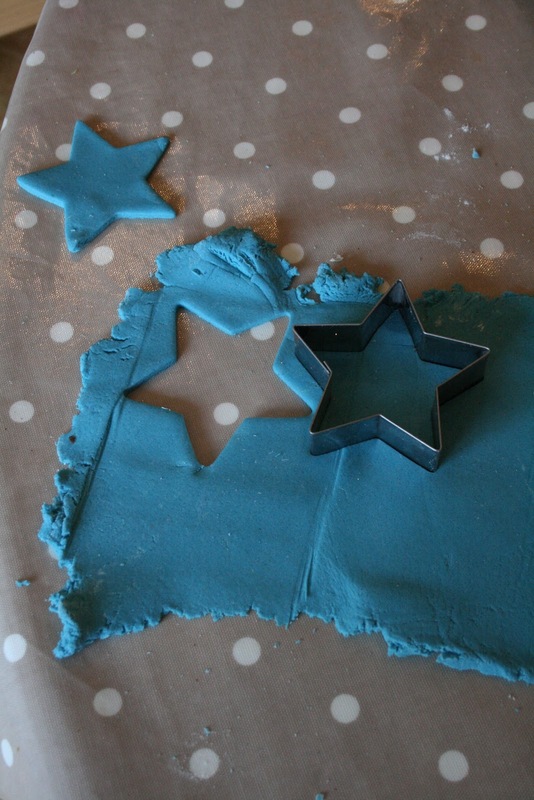 We use 1 cup of plain flour, 1/2 cup of salt and 1/2 a cup of water (and some food colouring.) It didn’t make as much but worked out fine otherwise. I remembered to make holes in the models this time, by poking a straw into the top. Then they went in the oven on a baking sheet for 2 hours at a low heat until they were baked hard and dry. 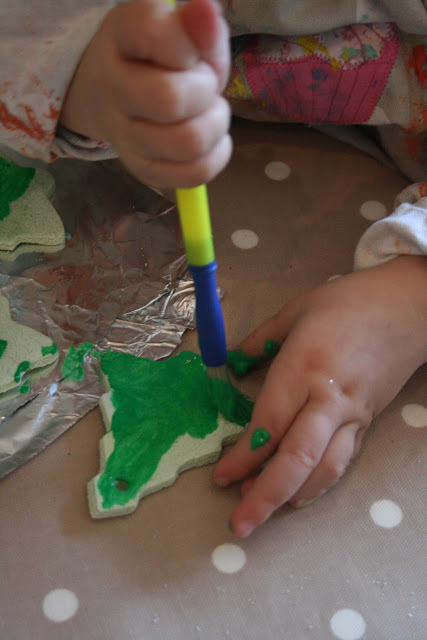 Cakie painted them all by herself and got really got absorbed by it, going back to add more to each one. 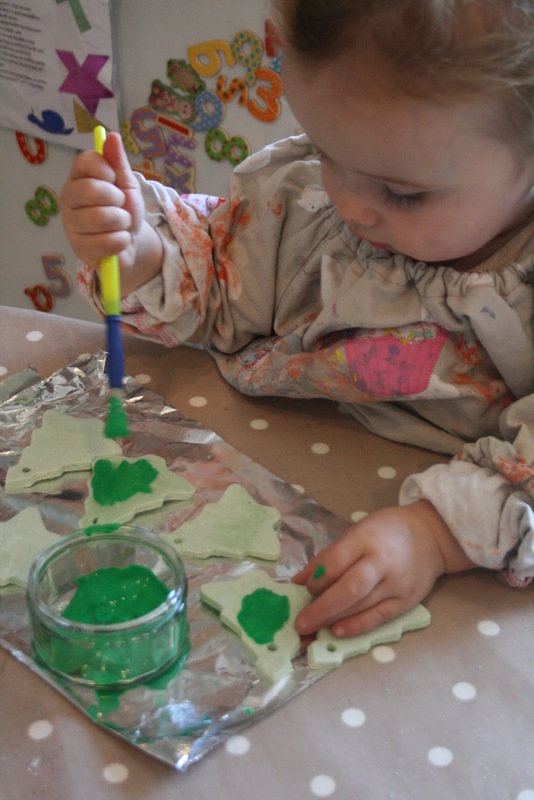 Here she is painting some Christmas tree shapes that we also made. Her finished efforts. 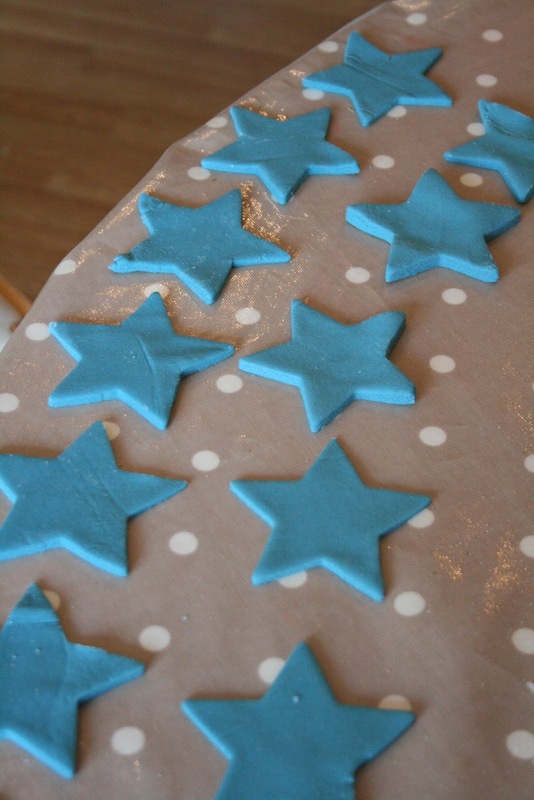 When these have dried out thoroughly overnight we will go back and add some sequins, felt shapes and glitter. Then we can thread through some raffia to make loops to hang them on the tree with. Can’t wait to get that tree! 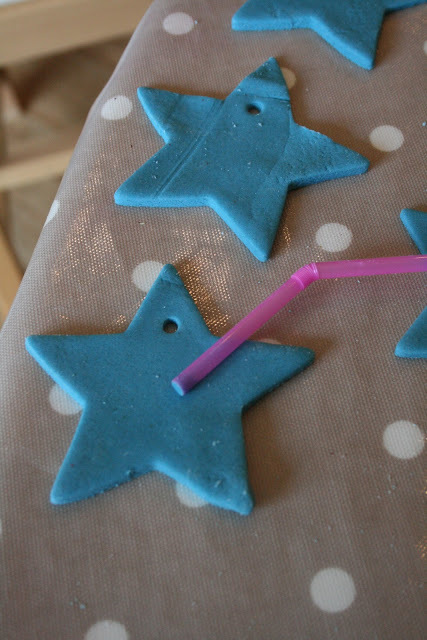 I will post the finished stars and trees when they are ready! 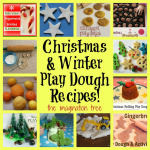 The A-Z of Play Dough Recipes and Activities! We are too. 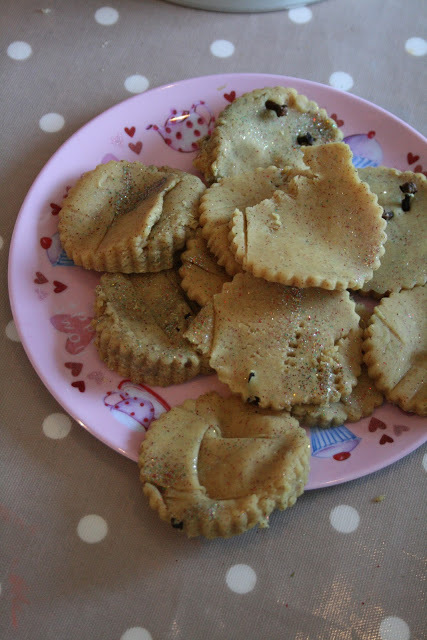 Hope I remember to poke the holes in as I usually forget and have to take them out half way through the baking! 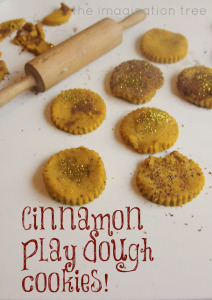 I have never heard of cinnamon play dough – so cool! Love your blue decorations too. If only we had our oven up and running. I have been very inspired by your website. We made these decorations and also made our own nativity idea. Please keep up all your hard work. plain dough is self-rising or all purpose ? I made it with self rising and it did not work. It got all cracked on on side and stayed wet on the other.